2019 Ford Explorer vs. 2019 GMC Acadia: Which Is Better? Two American family haulers go head to head. The 2019 GMC Acadia returns basically unchanged. 2018 Ford Explorer vs. 2018 GMC Acadia: Which Is Better? Can the aging Explorer keep up? We spent a week with the GMC Acadia Denali to find out if the crossover presents a viable alternative to a luxury SUV. 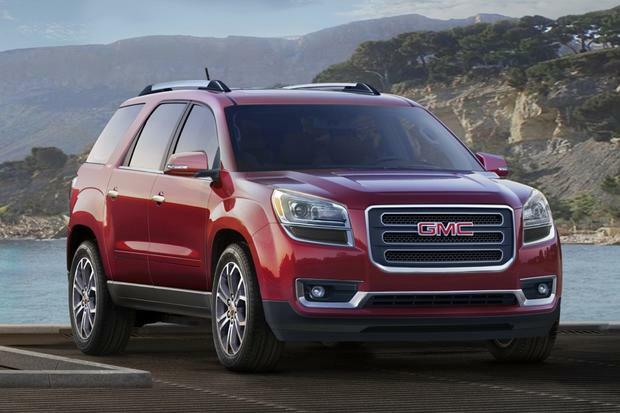 2015 GMC Acadia vs. 2015 Chevrolet Traverse: What's The Difference? We took a close look at the differences between the 2015 GMC Acadia and the 2015 Chevrolet Traverse. Like its nearly identical siblings, the Buick Enclave and Chevrolet Traverse, the 2015 GMC Acadia offers an extremely complete package emphasizing passenger comfort, drivability, functionality, fuel economy and spaciousness. So spacious is the Acadia, in fact, that it can seat up to eight passengers and still retain a reasonable amount of cargo room. Although the three large GM crossovers are mechanically and structurally the same, each establishes its own distinctive personality with unique features and design cues. While the Buick Enclave is the most upscale and the Chevrolet Traverse focuses more on utility, the GMC Acadia bridges the two by offering an even mix of practicality and rich user content. 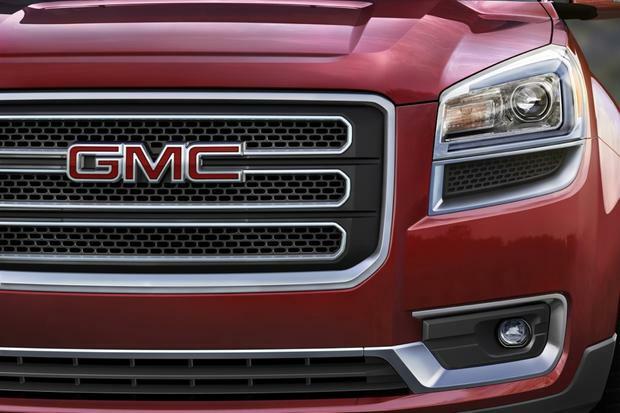 Furthermore, the Acadia distinguishes itself with bolder, squared-off styling that speaks to its GMC truck heritage. Despite its freshly updated and ruggedly designed exterior, the Acadia is not based on a truck. It's not designed for heavy trailering or off-road adventures. For these kinds of activities, a full-size SUV such as the Tahoe is better. That said, the Acadia is still capable of towing a 5,000-lb boat and treading through virtually any kinds of road conditions when equipped with all-wheel drive -- that kind of competence is more than sufficient for the needs of most American families. The Acadia receives no major changes for the 2015 model year, save for some new wheel designs and a few new colors. 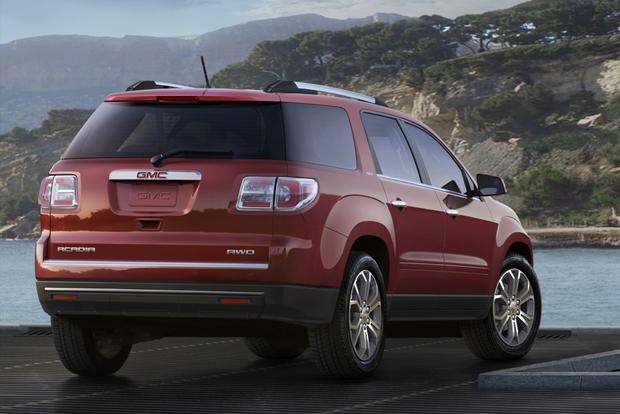 The GMC Acadia is available with front- or all-wheel drive. Power comes from a 3.6-liter V6 that makes 288 horsepower and 270 lb-ft of torque, while a 6-speed automatic is the only transmission. Gas mileage is rated at 17 miles per gallon in the city and 24 mpg on the highway with front-wheel drive or 16 mpg city/23 mpg hwy with all-wheel drive. 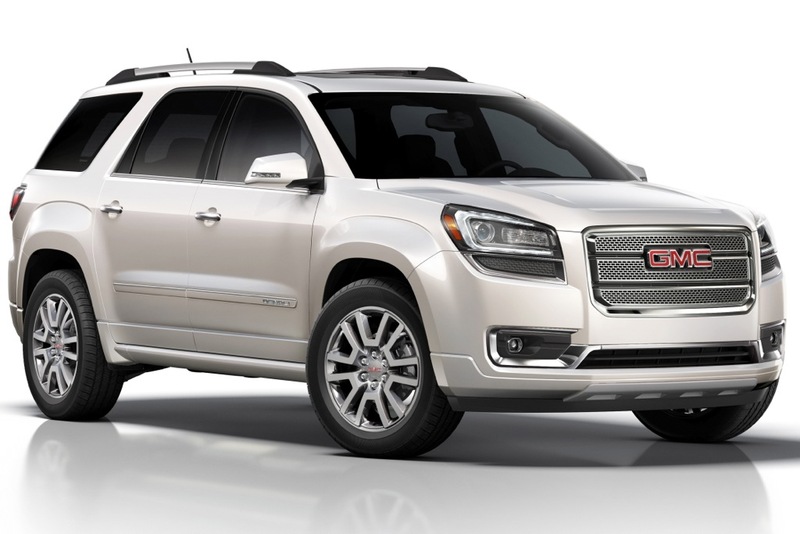 The GMC Acadia offers five trim levels: base-level SLE-1 and SLE-2; mid-level SLT-1 and SLT-2; and an upscale, luxury-oriented model called the Acadia Denali. Base-level SLE-1 models feature a standard 8-passenger seating configuration, while other Acadia models offer standard seating for seven and optional seating for eight. Included on the SLE-1 ($34,900) are 18-inch alloy wheels, automatic headlights, OnStar, Bluetooth, keyless entry, tinted windows, cruise control, park assist, a rearview camera, and a 6.5-in, center-mounted touchscreen featuring GMC's IntelliLink system. There's also a USB port for music and charge-only USB ports for rear passengers. New as of last year is a standard lane-departure warning system and forward-collision alert -- two features formerly standard on only the high-end Acadia Denali. Move up to the SLE-2 ($36,300), and you get a power lift gate, a remote starter, power driver's and passenger seats, voice control for the infotainment system and Bluetooth audio. As mentioned, the SLE-2 also trades in the SLE-1's second-row bench for second-row captain's chairs, which drops seating capacity to seven. The bench remains an option. Choose the SLT-1 ($41,500), and you get leather upholstery, heated front seats, tri-zone automatic climate control, a Bose sound system, 19-in alloy wheels and heated mirrors. Next up is the SLT-2 ($42,800), which boasts driver memory settings and power-folding mirrors. It also adds a few new options, including a Technology package with xenon headlights, a head-up display and audio controls for third-row passengers. Topping the range is the Acadia Denali ($48,400), which includes the SLT-2's Technology package as standard equipment. It also adds a few unique exterior touches, a panoramic sunroof, 20-in alloy wheels and a wood-trimmed steering wheel. In terms of options, the Acadia offers a panoramic sunroof (standard on the Denali, not available on the SLE-1), a navigation system and a rear-seat DVD player. The Acadia's roster of safety equipment includes anti-lock brakes, stability control, traction control and six standard airbags, including third-row head curtains. The new front-center airbag, designed to provide a cushion between the driver and front passenger, is standard on all but the base Acadia SLE. A blind spot monitoring system and rear cross-traffic alert are standard on the Acadia Denali and available on the rest of the lineup. 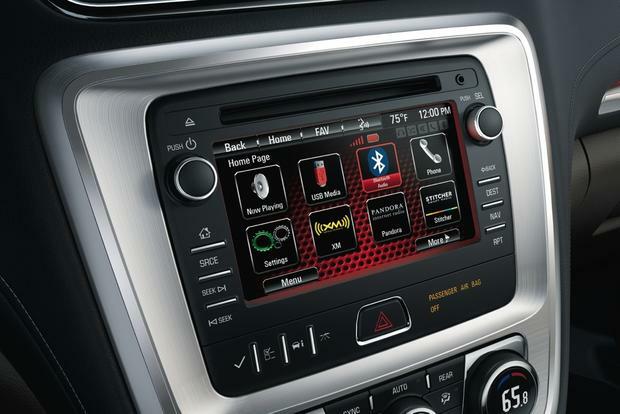 GM's OnStar emergency telematics service is standard across the Acadia range. In government crash tests, the Acadia received a perfect 5-star overall score, comprised of five stars for frontal and side crash protection and four stars in the government's rollover assessment. 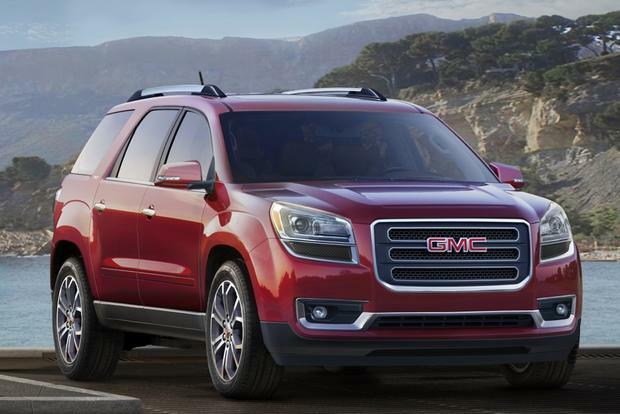 The 2015 GMC Acadia delivers, above all, a comfortable and well-controlled ride. It's smooth and quiet without feeling floaty, which results in daily commutes that are high on driving enjoyment and low on fatigue. Like its Buick and Chevy counterparts, the Acadia benefits from carlike handling, which is a function of its carlike unibody construction. It feels sharper and more secure than most other big SUVs, which inspires plenty of confidence in corners. Still, drivers must remain conscious of the Acadia's large size, which becomes apparent on narrow city streets or in crowded parking lots. Among other concerns, low-speed maneuverability is limited. The Acadia's power gives it a smooth and confident manner. When the need arises, it can accelerate strongly both off the line and in passing situations at highway speeds. Don't expect the same performance, however, when the vehicle is loaded down with passengers and cargo or towing a heavy load. Although it's not meant for off-roading, the Acadia is more than capable in harsh weather and on rough roads, especially when equipped with all-wheel drive. Available 19- and 20-in wheels are helpful in wet and snowy conditions. Mazda CX-9 -- The CX-9 has a sportier look than the Acadia, but the Acadia offers more interior room for passengers and cargo, and its plush trim makes it a better bet for long-distance interstate cruising. Chevrolet Traverse -- Based on the same GM architecture as the Acadia, the Traverse is very similar in all respects. 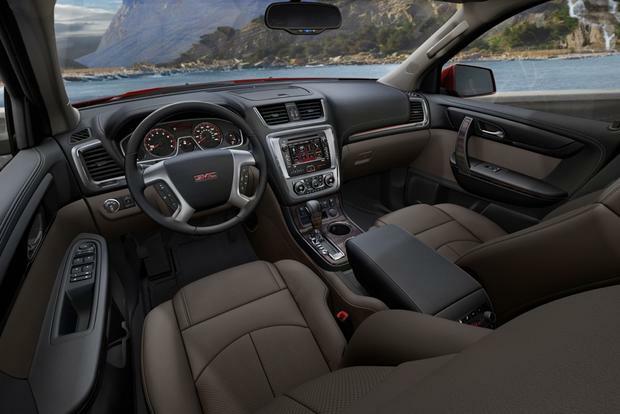 The Acadia's interior materials are nicer, but the Traverse has a roll-mitigation system not found on the Acadia. Dodge Durango -- The Durango is more like a traditional SUV and as such offers more off-road and towing prowess. The Acadia is ahead in space, ride comfort and fuel efficiency, however. Of the Acadia's five trims, a mid-level SLT-1 is our pick. It's equipped with the most balanced array of amenities for the money. The up-level SLT-2 and Denali models are perhaps overloaded with creature comforts, while the base SLE trims are a bit too simple for our tastes. We suggest considering adding some stand-alone options, such as navigation and the rear-seat DVD system, to the Acadia SLT trims, especially for families who like to travel. Everyone, especially if you live in a cold climate, should consider the added traction of all-wheel drive.